Participants of Get Lean Fiji with fitness instructor and personal trainer Adelene Louise Tutu third from left infront with red top. Photo: Supplied. Those were the words of local owner Get Lean Fiji, 27- year- old Adelene Louise Tutu of Suvalailai village, Rewa with maternally links to Sigasiganilaca in Galoa, Serua. Meet Adelene, a fitness instructor and personal trainer who can bring per­sonal training to your door step that is affordable and specially designed for women, men, young and old who are committed to transform their health and well-being. The mother of two said three high intensity workouts for each week with balanced meals is all it takes to achieve the results people need and no fancy equipment and no gym memberships are needed. “My business has been in operation since October 2017 when my second child was around a year old,” Ms Tutu said. “I began thinking about my career and I did not really know what I wanted to do. “While chatting with a friend, she asked me what I loved apart from my family and I said exercise, then she sug­gested that I become a personal train­er,” she said. Ms Tutu expressed that it was through her fitness journey that she felt the full potential and the strength to confident­ly continue her business. “And that’s what made me become a trainer, to help others feel the same,” she said. Ms Tutu said training her first cli­ent was a huge challenge whereby she felt nervous trying to make it happen through the first week. “But comparing it today I managed to have about 70 clients per week. “During my journey, I also started a meal preparation service where my Get Lean chef prepares a week of meals tai­lored to the macronutrient needs of my clients,” she said. Ms Tutu had successfully applied for a $20,000 grant from the Government’s Young Entrepreneur Scheme (YES) un­der the Ministry of Industry and Trade. “I also hosted my first Get Lean (Fiji) charity event at which able to raise about $650 dollars for the Chanel Home of Compassion and St Christopher’s Home, and also received donations of clothes and books,” she said. She said she is challenged with having to wake up in the morning and balanc­ing family time with the demands of her business and making it successful but she thanked her family’s support. “My client’s achievements make me proud because they always think that it was impossible,” she said. “Seeing older women who exercise more than the young ones which enable them to lose more than 20 kilogram in eight months, inspires me to continue my work,” she said. “Growing a business is a challenge which will come in good and tough times. Find a mentor you can trust. 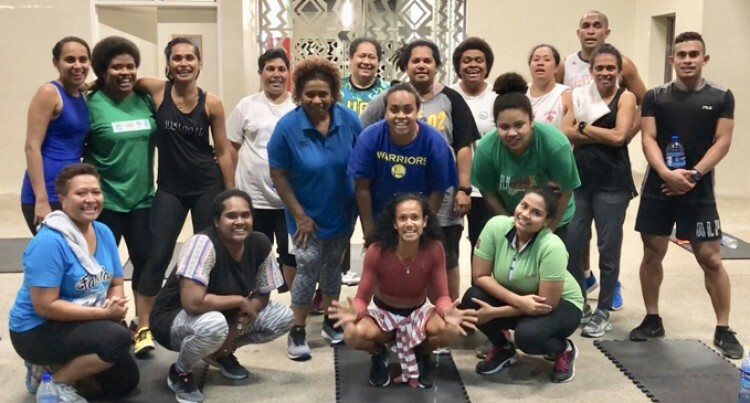 Ms Tutu said her dream is to keep building the Get Lean (Fiji) Community of women who feel strong and confident in themselves and also inspire others to transform their health. She added that with the assistance of the Government YES Grant, she is de­veloping a smart phone app to assists in exercise and healthy eating habit for the public. She is currently planning to open her own personal training studio and café, like a one-stop Get Lean shop and hopes to expand her business. All trainings are held at Albert Park pavilion in Suva on Monday, Wednes­day and Friday mornings and after­noon at 5.30 and Tuesday and Thurs­day afternoon at 5.30pm.